Welcome to Geree's Card Store from Pichilemu, Chile dedicated to the vibrancy of the rich, lush colors of the beach. See more tropical artwork by Geree on calendars, business card templates, tote bags, Keds shoes for women and girls, surfer t shirts, mousepads and much more at: www.Zazzle.com/GereesGallery* in The Sun & Surf Shop. About Me: I am an American abstract artist living in South America. Color motivates me to be an artist and I use bright, high intensity colors usually with a lot of contrast. 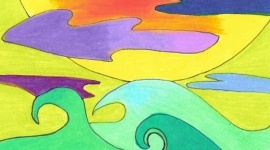 One of my early artistic influences was Peter Max's vibrant artwork in the animated Beatles movie, "Yellow Submarine." Another artist who influenced my style is the late Lauel Burch with her delightful abstracts of cats and dogs.